Sandwiches, this incredible filling food are definitely a life saver when if you are having a hectic day ahead or if you are in hurry, just put anything in between two slices of bread, pack it and go on. Sandwiches can be prepared in a jiffy, any fruits, vegetables or a simple leftover stir fries can make an excellent stuffing for a sandwich. We love making sandwiches often, obviously they have their important place in our menu. Even a kid can make a simple sandwich with a help of an adult. Coming to today's Sandwich, this breakfast sandwich is definitely one of the easiest sandwich i love to prepare often whenever i feel like adding fruits in my kids diet. 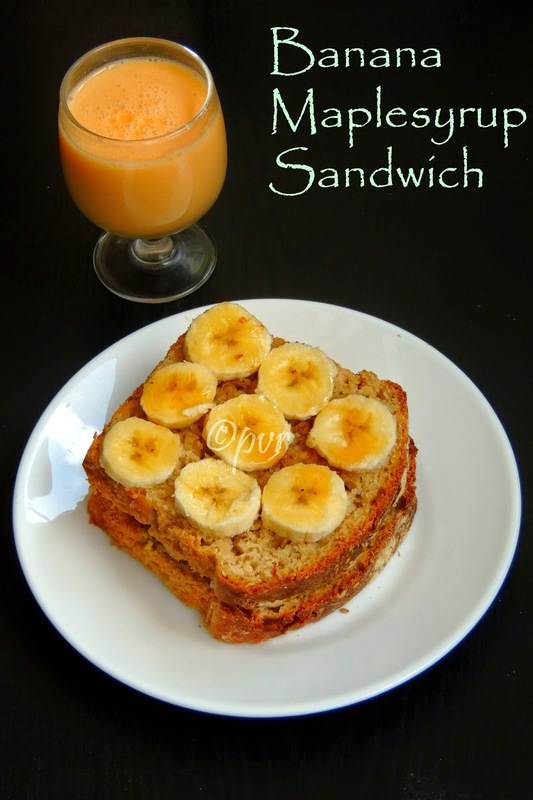 Any fruit can suits prefectly for making this sandwich however i'll stick always to the humble 'Bananas'.Usually if my kids skip their breakfast at home, i'll make sure that they eat atleast a sandwich while they are in midmorning break at school. I'll definitely pack them a quick sandwich and drop it in their school bags to have it during their break. Obviously i make varieties of sandwiches just with simple ingredients in it. Serve this sandwich with a filling smoothie or a drink for a sunday brunch, am sure none will get hungry before their lunch. Yes this sandwich is an excellent filling meal, one can have it without any fuss. I used maple syrup in this sandwich, in case if you dont have this syrup just replace it with honey or simply with nutella. Nutella works absolutely tremendous in this banana sandwich. I prepared this sandwich with the No Knead Light Wheat Loaf slices and this sandwich are going straight to be a part of this week's blogging marathon as am taming the yeast this week. Yes my theme for this week is Tame the yeast,such an interesting theme and am loving it. Check out the Blogging Marathon page for the other Blogging Marathoners doing BM#43. Drizzle enough maple syrup over a slice of bread. Arrange the banana slices one by one over the syrup drizzled slice. Top it with an another slice, arrange again the banana slices, drizzle generously with the syrup. Enjoy with a smoothie or with your favourite drink. Oh wow..smart way to incorporate bananas in diet . wonderful idea to have in sandwiches. you are making me hungry early in the morning.. sandwiches look sooo yumm..
my fav go to if I want something sweet toast for my breakfast.. Superb choice Priya..never thought of this simple one..very nicely made use of the bread! aah.,.thats such a lovely neat sandwich ! 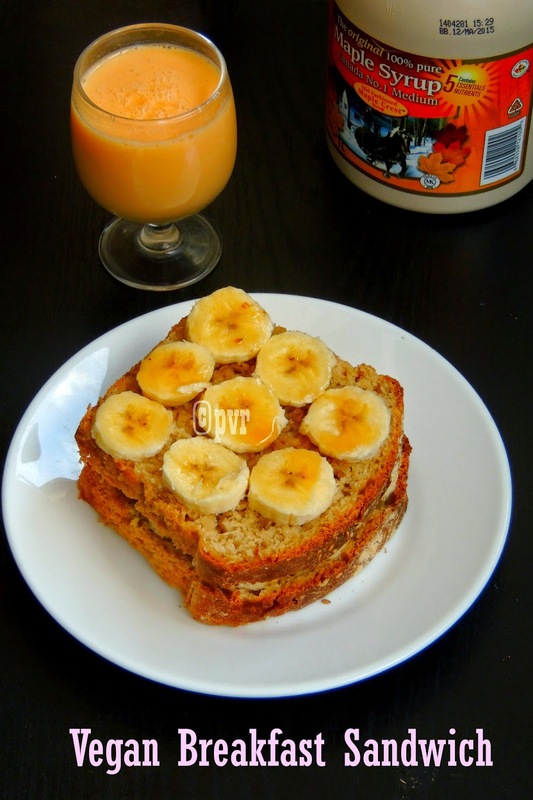 healthy n quick breakfast recipe!!! J'adore ce sandwich. Il semble des plus délicieux. Je note. That's indeed a welcome change from usual jam - Nutella sandwich..yummy ! Love this sandwich idea with maple syrup. Such a yummy looking sandwich -- and so quick and easy to make too. Had tried peanut butter and banana but never maple syrup. Sounds sweet! I am sure my daughter will love it. Must try it. My kids will so love this. Great idea, Priya.